You already know I’m a sucker for needlework books, and as full as my bookshelves may be, I can always somehow find room for more. 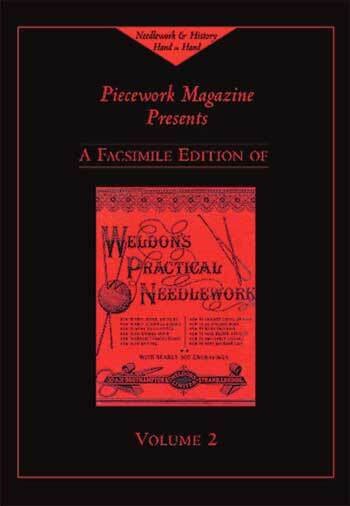 Interweave Press puts out facsimile copies of all the Weldon’s Practical Needlework books. I’d love to have this collection! But the cover price for one volume is generally $30. Right now, you can pick them up for $18 each, which isn’t too bad. The various volumes of this copious needlework publication contain all kinds of needlework instruction and patterns. The individual volumes cover many needlework interests: knitting, crochet, embroidery, lace making, canvas work, smocking, drawn thread embroidery, Mountmellick embroidery, and the list goes on. While each volume doesn’t contain every single type of needlework, the books are varied enough to keep a needleworker occupied for a long time! In the needlework section, you can also find quite a few back issues of Piecework Magazine available at a discount. Now might be the time to finish your collection, if you’ve been trying to build one. From what I understand, the site will still be here and look like it does now, until the transition is made. It will just be stagnate, as I won’t be able to post through Blogger after April 30th. Keep an eye out for tomorrow’s sneak peek! Best of luck with the transition. Looking forward to new site. Congratulations, the new design is looking great and the categories are very strucured. Great piece of work! Thank you for all the wonderful work you did so far and good luck with the new site! Next Next post: Welcome to the New Needle ‘n Thread!